The holidays are over, and your decorations have all come down. A great way to bring some life back to your home is to consider designing with indoor plants. 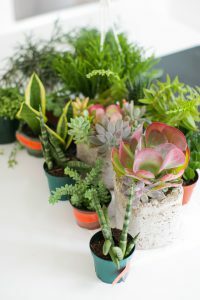 The frigid Indiana winter months mean you have a break from watering and maintaining your outdoor plants, so you should consider visiting Allisonville Garden & Home to speak with Houseplants Specialist, Ra Gadd, who can help inspire your next indoor project. Regardless of the simplicity or the complexity of the project, Gadd is able to lend a hand in making the right plant selections and pairings that will result in something beautiful to add to your space. Vertical indoor plant walls are a growing trend seen more commonly in commercial applications, such as restaurants and hotels, but after discovering Florafelt (florafelt.com), an online retailer and manufacturer of a variety of DIY products that fall within the plant wall category, I placed an order and knew that my next stop was to speak with Gadd. She offered the following advice that led to a gorgeous new feature wall in my home. STEP 1: Plant Selection Gadd suggested that I fill the pockets of my Florafelt planter with a variety of succulents. She helped choose plants with varying heights, textures and colors that would pair well together from a design standpoint. They had an amazing selection to choose from. STEP 2: Plant Layout Once I got my plants home, I found it helpful to lay them all out in a similar arrangement to how they’d eventually hang on the wall. Gadd suggested that diversifying each pocket would give me an overall more visually appealing end product. STEP 3: Pocket Arrangement I had 16 individual pockets to design, and Gadd suggested that I think of each one as it’s own plant design. Florafelt’s website offered instructions on how to properly wrap the plant roots of each pocket with a sheet of felt and a rubber band. STEP 4: Home Stretch The final step was to slide the arrangements into each of the wall pockets. 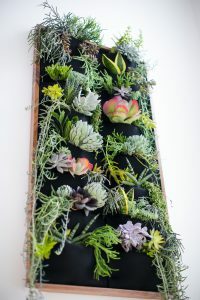 Stretching them allows ample room to slide the arrangement in but still have a firm fit since the roots of the plants will eventually grow into the felt material. When you’re ready to tackle your next indoor plant project, visit Allisonville Garden & Home for inspiring advice and the best selection in houseplants.